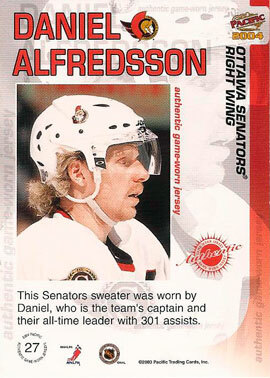 Daniel Alfredsson (born 11 December 1972) is a Swedish professional ice hockey player. He is considered a leader by exampleand has been compared to Steve Yzerman in his value to the Senators. 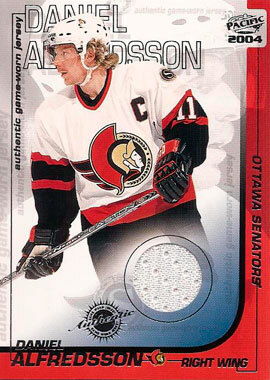 Drafted 133rd overall in the 6th round of the 1994 NHL Entry Draft, Alfredsson was a serendipitous pick by the Senators. He is one of the league's top two-way players, and he holds the Senators' franchise records for goals (404), assists (655), and points (1059) with 1100 games played. In October 2008, Alfredsson underwent arthroscopic surgery on his right knee to remove a bone chip and returned less than a week later. 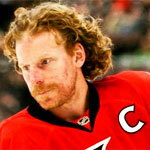 On 30 October 2008, Alfredsson agreed to a four-year contract extension with Ottawa worth $21.6 million. The contract, intended to allow Alfredsson to finish his playing career with the Senators, included a no-movement clause. Daniel Alfredsson was the 75th player to reach 1,000 career points in the NHL, scoring three goals in a win over the Buffalo Sabres on 22 October 2010.